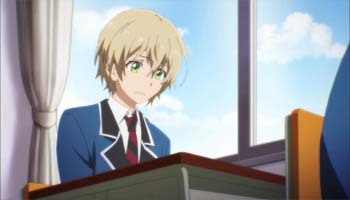 In this episode of Aoharu X Kikanjuu, an old character re-emerges to help out a close friend who is feeling depressed. We also witness another character display their love towards someone they like, and it involves eating breakfast half naked. In this episode of Aoharu X Kikanjuu, Hotaru is depressed over the fact that her team lost in TGC. She's especially down because she couldn't defeat Midori's "evil," as she puts it. Instead, Midori reveals Hotaru is "evil" as well. 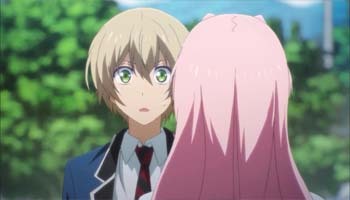 The episode focuses on her wavering feelings about the events of the tournament, since her confidence is shattered by Midori and she couldn't defeat his team, which leads her to declare she should just quit survival gaming.A concerned friend decides to help her out of this slump, by giving Hotaru the kind of pep talk she usually gives other people. We have not seen Kanae Yajima since the second episode, but this episode has the spotlight on her. She actually doesn't like Hotaru playing survival games, since it's not healthy for a girl to be doing such a manly hobby, but seeing her depressed worries Kanae a lot more. If playing survival games will get the confident and happy Hotaru back, then Kanae will do her best to make it happen. She challenges Hotaru to a contest, and reminds her of this beautiful statement Hotaru once gave to her class. Kanae hammers the point by setting up a scenario where Hotaru's advice works best, and it definitely re-energized Hotaru. Hotaru might be moved by Kanae's effort more than her own advice though, since her friend toiled in dirt just to help her. That's a true friend, don't you think? Kanae is someone ready to help a troubled Hotaru at the cost of looking like a fool in gym shorts. At this late in the anime, the story still feels a bit directionless. While the story arc now focuses on Masamune's team getting a rematch with Midori's team, the show still seems a bit lost on what it really wants to be. Is it a BL show about handsome guys playing survival games, or is it a story of a girl falling in love with a sport that just happens to have handsome guys in it? The story has romance, action and bishie fan service yet nothing really feels that prominent. 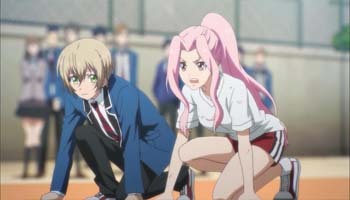 In this episode, we are treated to a pink haired girl looking pretty in a PE uniform while also witnessing Takatora's devotion to Midori taken to another level. They are unexpectedly close, as it was the other focus of this episode. Takatora has a spare key of Midori's apartment and he tries to wake Midori up. 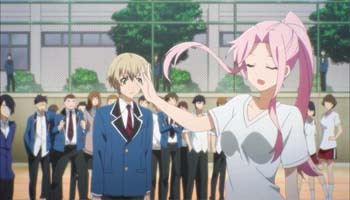 The scenario is familiar, since most harem shows utilize it by having a girl wake up the main character in the same fashion. This scene feels like Takatora is a giddy school girl taking care of his crush. He even cooked him breakfast, and Midori greeted him coming out of the shower half naked. The banter between Takatora and Midori was cute at first, but now it feels a bit too much. Its confusing scenes like this that muddles up the show. 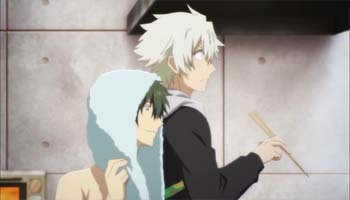 This anime is clearly intended for fans of BL shows, who enjoy seeing handsome guys taking care of each other. Or is it for action fans, who'll be thrilled at the fast paced survival game confrontations? Should it really appeal to both? The show seems to be, but its having mixed results right now since it's offering opposing ends of the spectrum: a girl running with her breasts bouncing and a half-naked guy with only a towel on. It's nice to see that Midori got into Hotaru's head, since she was completely down after their confrontation. He hits her where it'll hurt the most, and she spends majority of this episode feeling depressed. It's refreshing to see a somewhat broken Hotaru though, since she is usually the one helping people out and not the other way around. It even came to a point where she wanted to quit, and it's interesting to see such a strong character fold like that. It points out just how evil Midori is, and how devastating their loss is. This makes their next confrontation with him a lot more exciting to watch given how much buildup there is leading to it. Hotaru is ready to reveal her secret, but it might cause more strain in the group rather than band them together. She might be kicked out of the group, and it'll finally explore Masamune's problems regarding their former female member. The conflict with Midori's team will strengthen the unity of Masaumne's group, so the rematch will be a lot more satisfying to watch. They'll fight Midori's team as a group compared to the one-on-one plan they previously had, which led to their loss the first time. Behind the Scenes of Skip Beat! More than the story of a young woman seeking revenge on the jerk who dumped her, Skip Beat! is a series about a teenage girl's journey of self discovery in the Japanese Entertainment Industry. Want to know more about this romantic comedy? Read on!